Cluetrain at 10: So How's Utopia Working Out for Ya? This event will be webcast live at 6:00 pm ET. Check out the Cluetrain Question Tool instance - ask your questions and vote on others! The Cluetrain Manifesto, posted in April, 1999, immediately became a touchstone in the digital culture wars. Its four authors – Rick Levine, Christopher Locke, Doc Searls, and David Weinberger - denounced the mainstream media's portrayal of the Web as an extension of business-as-usual into a medium cheaper than paper and TV time. No, said Cluetrain in 95 "theses" (a number chosen for its resonant overstatement), millions of people weren't flocking to the Web simply because they so loved online catalog shopping. The Web was a place where each individual had a voice, and each of those voices could connect with any and every other voice. The Web is a conversation. And -- in Cluetrain's most famous formulation -- so are networked markets. Cluetrain.com and the subsequent book of that name are polemics. They express anger at the attempt of the old regime to co-opt the Web and joy at the possibility of building a new set of human connections, free of the dehumanization of the Mass Age. But, that was ten years ago. The Web has gone from millions to over a billion, from frontier to settled land, from unnumbered to Web 2.0, from home pages to Facebook, from laptops to iPhones, from email to Twitter. Entire industries and institutions have collapsed, and many more have been transformed. Spam, identify theft, cyber-bullying and killers leaping straight out of Craigslist are on the scene, as well as Wikipedia, a gift economy, and the online politics of yes-we-can. On the tenth anniversary of The Cluetrain Manifesto, how's all that freedom, that cyberutopianism, that Internet exceptionalism working out for you? 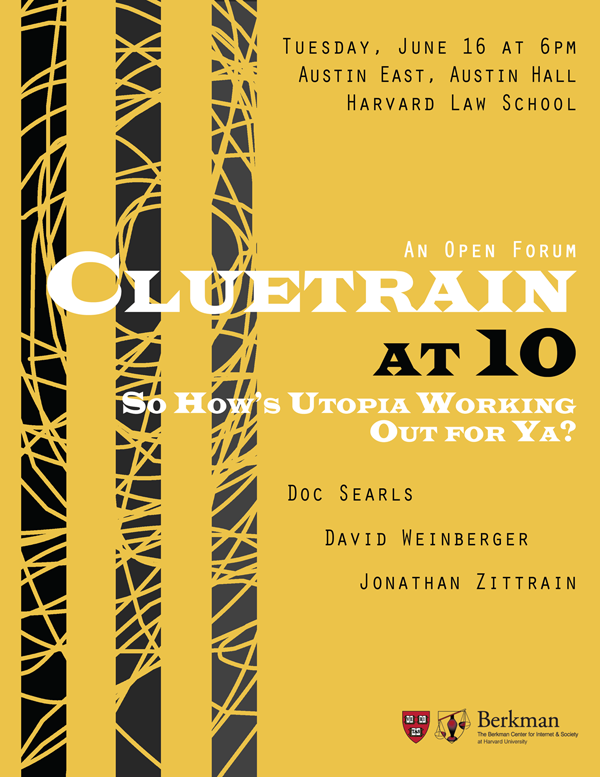 Harvard Law professor and co-founder of Harvard's Berkman Center for Internet & Society Jonathan Zittrain talks with two of The Cluetrain Manifesto's co-authors, Doc Searls and David Weinberger, in an open forum. This event will commemorate the release of the tenth anniversary edition of The Cluetrain Manifesto. Doc Searls is Senior Editor of Linux Journal and a well-known and widely quoted blogger. His work as a journalist, speaker and advocate of the Internet led to a Google-O'Reilly Open Source Award for Best Communicator in 2005. In "The World is Flat," Thomas L. Friedman calls Doc "one of the most respected technology writers in America." He is a Fellow at the Berkman Center. David Weinberger is the author of Small Pieces Loosely Joined (2002) and Everything Is Miscellaneous (2008). He writes frequently for many major journals, is a frequent contributor to National Public Radio, advises start-ups and non-profits, and has been an adviser to two presidential campaigns. He is a Fellow at the Berkman Center. Jonathan Zittrain is a Professor of Law at Harvard Law School, is a co-founder of the Berkman Center for Internet & Society and served as its first executive director from 1997-2000. He is the author of The Future of the Internet – And How to Stop It.